Andrew Buchanan. American Grand Strategy in the Mediterranean during World War II. Cambridge: Cambridge University Press, 2014. Pp. 311. The Mediterranean region during the Second World War was in many ways the staging area for the eventual defeat of the Axis powers. It was here that the United States, along with its British and Commonwealth allies, began their major counter-offensives against Fascist Italy and Germany leading to heavy combat on land, sea and air, culminating in an Allied victory. Andrew Buchanan, a senior lecturer at the University of Vermont, offers a new interpretation of the U.S. experience in the region with his new book American Grand Strategy in the Mediterranean during World War II. Buchanan argues that the U.S. did not view the Mediterranean as a “peripheral theater,” but developed grand-strategic interests in the region which were secured by the successful interlinking of political, military and economic power. Essentially, the author effectively demonstrates how the success of this regional grand strategy allowed the Mediterranean to be most accurately described as an “American lake” by the end of the war and how the transformation of U.S. strategy occurred over time. The popular narrative of the Mediterranean theatre is that the U.S. was more of a reluctant participant in the region, and that it was the British who were the leading force behind Allied strategy and operations. However, the interesting revision offered by Buchanan is that U.S. participation was not reluctant and was driven by certain U.S. political elites, including President Roosevelt. Interestingly, Buchannan compares Roosevelt’s view of grand strategy in the Mediterranean to that of famous navalist Alfred Thayer Mahan, who emphasised accumulating new bases and zones of control. Roosevelt’s regional interests clashed with the strategic tunnel vision of senior U.S. military officials who were focused on how to defeat the Axis as quickly as possible and were not thinking of the peace that would come in the post-war period. The author’s analysis goes well beyond just the military sphere of the war, but demonstrates how the U.S. utilised diplomatic networks (both formal and informal) as well as economic power to help shape the region to acquiesce to its interests. For example, Buchanan shows how, starting in 1944, the U.S. used its economic might to help rebuild Italy, which gave it considerable influence during that country’s post-Fascist political development and helped slide it under the umbrella of an emerging U.S.-led liberal world order. The book details the evolution of the U.S. experience in the Mediterranean throughout the war. It discusses how the U.S. used a mix of diplomatic appeasement and economic relations to guarantee Spain’s neutrality and how the U.S. balanced relations between the Vichy and the Free French political communities. It outlines how, following the launching of Operation Torch, U.S. military and diplomatic personnel found themselves with a complicated new task of having to administer European colonies in Africa. The later chapters of the book deal with the invasion and occupation of Italy and of relations with the Balkans. The narrative avoids detailed overviews of the operational- and tactical-level fighting, rather focusing the bulk of its attention on the political and economic dimensions of the war and their interplay with military strategy. To support his analysis, Buchanan undertook extensive archival research in both the U.S. and U.K. as well as examined the unpublished private papers of several key diplomatic figures. An underlying theme found throughout the book is the interplay of the pursuit of a realpolitik approach to national interests and the influence of liberal normative factors in shaping U.S. foreign policy. Pragmatic realpolitik was often at the forefront of U.S. policy, particularly during the early days of the war when the U.S. was in a weaker position. For example, Roosevelt recognised the legitimacy of the authoritarian Franco government in Spain and the Vichy government in France and later upheld stability in French colonial Africa. However, liberalism was able to grow in influence as the U.S. strategic position grew stronger, and by 1944 the U.S. began to more actively reshape the region with liberal principles in mind. Overall, Buchanan’s analysis here is sound, yet could have been strengthened by engaging with some of the literature on U.S. strategic culture which has extensively examined this interplay of liberalism and pragmatism and on how normative factors influence the development of policy. At its core, this book is really a story of rising hegemony and power transition, where emerging great powers reshape the world around them to fit their interests. The international system is consistently in a state of flux where states’ capabilities in relation to peer actors are either rising or declining. 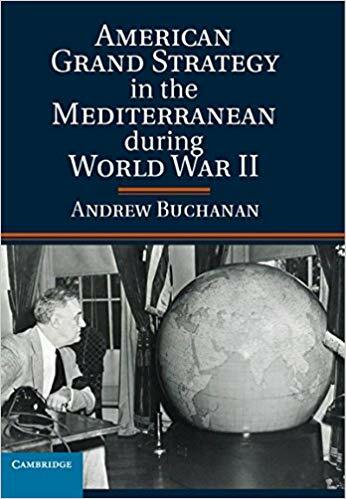 Buchanan’s book shows how, by the end of 1944, the U.S. was able to surpass the influence of the U.K. in the Mediterranean militarily, politically and economically. The U.K. lacked the resources possessed by the U.S. and so it was Washington, not London, which oversaw the construction of the new political dynamics of the region. This process was very complicated as, Buchanan observes, “[t]here was no manual—no Global Hegemony for Dummies—to guide U.S. policy makers toward becoming the predominant power in the capitalist world” (p. 272). However, Buchanan concludes that the U.S. managed to overcome these difficulties, and the construction of the new liberal world order would continue into the post-war era with events such as the establishment of the Truman Doctrine. This book succeeds as a comprehensive and convincing analysis of America’s grand strategy in the Mediterranean. It is worthy of study by scholars of American diplomatic history, Anglo-U.S. relations, and, of course, the Mediterranean region during the Second World War. Further, international relations’ scholars interested in the processes of peaceful power-transitions and how new global orders are constructed will find the work useful. Buchanan’s engaging writing style will also appeal to even a casual reader of Second World War history interested in something beyond purely military-centric narratives of such an important period in human history. See James Lacey, “Towards a Strategy: Creating an American Strategy for Global War, 1940-1943,” in The Shaping of Grand Strategy: Policy, Diplomacy, and War, Williamson Murray, Richard Hart Sinnreich and James Lacey, eds. (Cambridge: Cambridge University Press, 2011); and Michael Howard, The Mediterranean Strategy in the Second World War (New York: Frederick A. Praeger, 1968). For example, Colin S. Gray, “National Style in Strategy: The American Example,” International Security 6, no. 2 (Fall 1981): 21-47. For more on the nature of Great Power politics, see Paul Kennedy, The Rise and Fall of the Great Powers (New York: Vintage Books, 1989); and A. F. K. Organski and Jacek Kugler, The War Ledger (Chicago: University of Chicago Press, 1980).